As we continue to make improvements on the list of metrics available in the Power BI Premium Capacity Metrics app, it gives me immense pleasure to announce the most awaited metrics: dataset size and the count of datasets in memory are now available in the app. Dataset size and counts in memory along with the comprehensive view of dataset refreshes, dataset evictions, queries and system metrics in the capacity for the past 7 days provide a more in-depth view into the health of a capacity. (1) Average size of datasets in memory in MB in the past 7 day. The table on the bottom left on the dataset tab lists out the size(MB) of the dataset and its workspace name in selected time range (default to 7 days in the filter page). 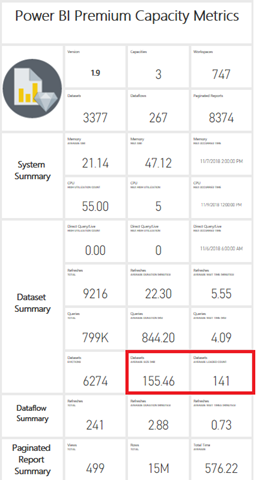 The bottom right chart on the dataset tab shows the number of datasets loaded in memory split into hourly buckets. Selecting any of the hourly bars on this chart will filter the result on the rest of the tables/charts on this page. Let’s get started by installing the service app. If you have a previous version of the app already installed, it’s best to delete it from your apps and then hit CTRL-F5 to refresh to avoid confusion with versions. 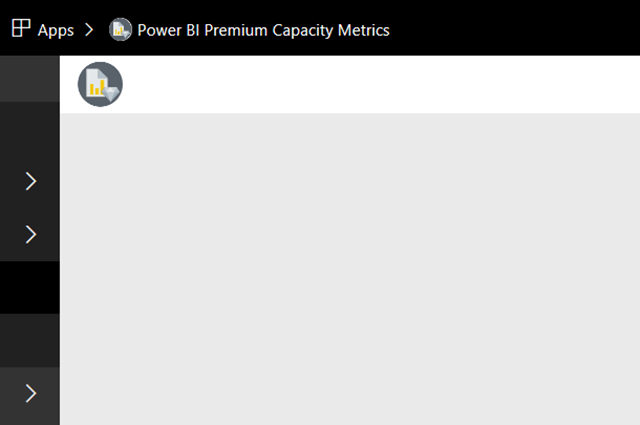 The app can be installed by searching for “Power BI Premium Capacity Metrics” in the Power BI apps or by clicking here to get it now. We are working on making improvements in the current service app installation experience. You may experience some delay during installation. We highly recommend you hit F5 on the app page and wait for the refresh of the report to complete before accessing the app. 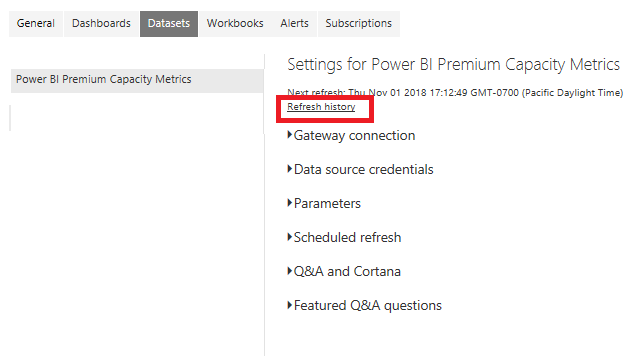 You can confirm the refresh status by checking the refresh history on the dataset settings. After a couple of minutes since installation, if the screen appears blank as below, please hit F5 to refresh the page to get the dashboard, report and dataset links. This same app can be used to monitor any A SKU capacities you may have in Power BI Embedded. They will appear in the report provided you’re an admin of the capacity. Refresh of the report can fail unless you grant certain permissions to Power BI on your A SKUs. 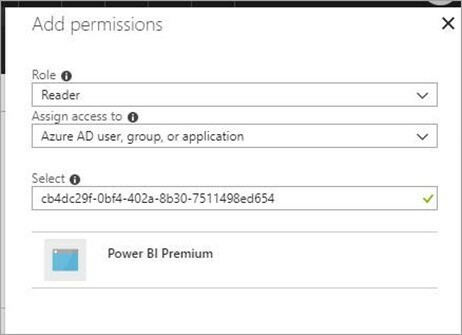 This can be done by opening your capacity in the Azure portal, clicking on Access control (IAM) and adding the “Power BI Premium” app to the Reader role. If you’re unable to find the app by name, you can also add it by its client Id: cb4dc29f-0bf4-402a-8b30-7511498ed654. 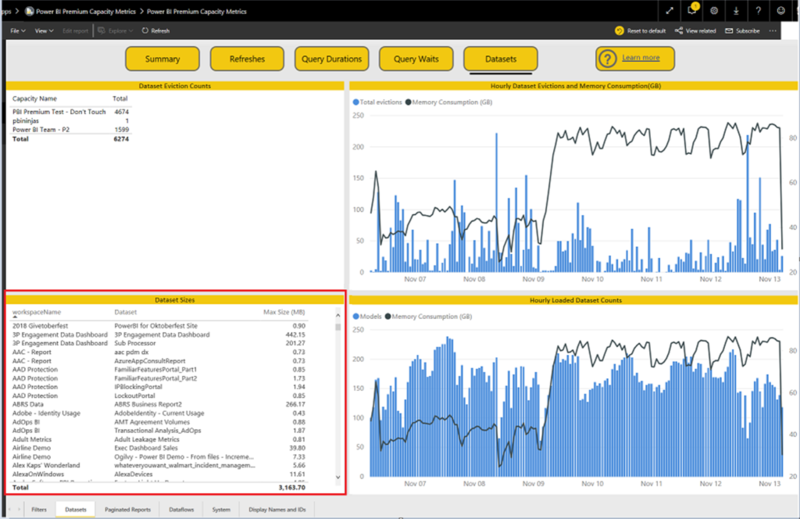 Now that you have the app installed, you can see metrics about all the capacities in your organization for which you are an admin. You can now make more informed decisions and more effectively manage the premium capacities, workspaces and datasets in your organization. These metrics are just the start. More detailed metrics and tooling will become available in the following weeks and months. And be sure to submit your ideas for more any suggestions. 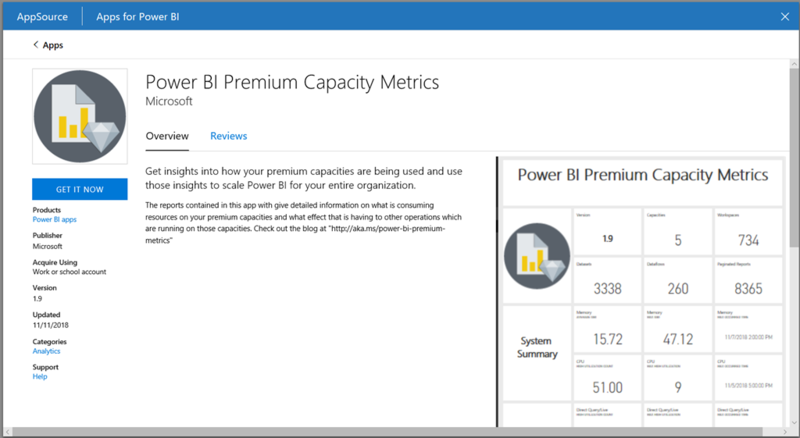 Learn more about what Power BI premium is, monitoring premium capacities and how Power BI Premium works. Check out "Managing Microsoft Power BI Premium capacities to your entire organization" YouTube session by Josh Caplan and Adam Saxton at Ignite 2018.